Palliative care is not more important! So on Wednesday, we were at home together for most of the day. We called the Fetal Medicine Unit (FMU) and left a message for Elysia Crouch, our link midwife there, to chase up the neonatology appointment. After the cardiology appointment the previous day, we were keen to get on with things and find out where we stood with the hospital. We knew that what we were considering – active treatment – was not the norm in the UK, and after some initial enquiries around the trisomy groups, we hadn't heard of any babies with trisomy 18 who had received it. So we were apprehensive about the appointment, and anticipated at least some initial scepticism. So in the early afternoon, we were happy to receive a phone call from Elysia Crouch. However, she hadn't received my message and was calling to ask whether we would be able to see George Donnachie earlier than planned the next morning, at 8:30am, as he had a busy day. That was fine with us, and I asked about the neonatal appointment. She said she'd give them a call and get back to us. Chris answered the phone when she called back, and she said, “Good news – I've got you an appointment with palliative care tomorrow at 12:30pm.” He was a little irritated and replied, “What about neonatology?” Elysia was slightly taken aback and responded, “But palliative care are far more important.” Chris insisted that no, neonatology was essential, and we didn't want to wait any longer to see them. She agreed to call them and let us know. When Elysia called back, I answered. She had arranged for the on-call neonatal consultant to see us tomorrow. The arrangement was that she would bleep them in the morning and they would come and see us sometime between the 8:30 scan and the 12:30 appointment with palliative care. Another long day in the hospital! So on the Thursday, we got up early and caught the busy rush-hour train to the hospital – no fun when you're pregnant. We stopped off at the cupcake stand to buy a couple of vegan cupcakes for our mid-morning snack, and got one for George too as it seemed like he had a busy day ahead of him! 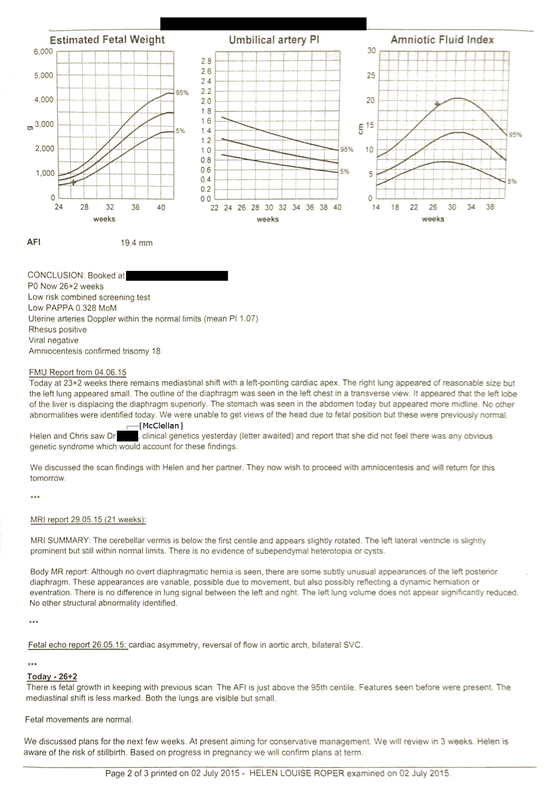 We appreciated how he routinely went out of his way for us – arranging the MRI quickly, doing the amnio at our preferred time, seeing us immediately after the diagnosis – and especially how he conducted discussions with us, genuinely engaging with our points of view and preferences. At 8:30 the FMU waiting room was empty, even of receptionists. George saw us straight away, alone for once; he'd obviously come in early, before any of the other staff had arrived. 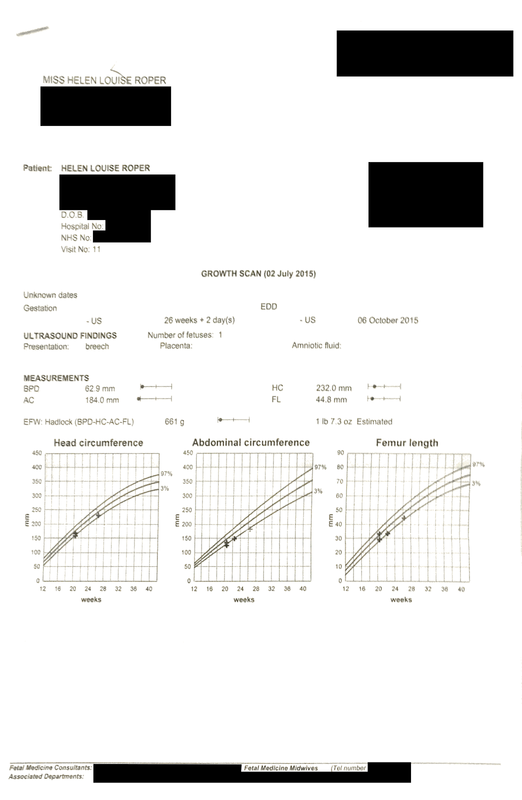 It was an uneventful scan: Rumer was still growing along the very bottom of the chart, although her abdominal circumference was dropping off slightly. The amniotic fluid remained high, just above the normal range. We forgot to ask for dopplers, which made us kick ourselves a bit later on. At the end of the scan, we said to George that we needed to see Elysia to find out when and where the neonatal appointment was going to be. He said that he didn't think she was in that day, which surprised us, given that she'd said that she'd make the arrangements then. George asked one of the other FMU midwives, Ophelia Somers, to assist. None of the FMU midwives knew anything about the plan, so we agreed that we would go and get a coffee and wait for their call. We tried to find somewhere we could sit for a while, and ended up in a nearby hotel with a coffee bar, and waited. And waited, and waited. We started to worry that the neonatal appointment wouldn't happen, or that it would end up as a joint appointment. We didn't want to see them and palliative care together, but did want to see neonatology as soon as possible. Finally, at around 12pm, one of the midwives rang to say that, indeed, we would be seeing neonatology and palliative care together at 12:30, in the FMU quiet room. It was obviously too late to protest, so we made our way back to to FMU.